1. If there is a lack of choice. And that’s it. That’s the list. To be fair, some people who operate under that misapprehension will sometimes say something about possible physical detriment too, vitamin D deficiency and rickets, which does happen to some hijabis, but that’s still consistent with thinking that any damage is all incidental. That is, people seem to think that there is nothing wrong with the hijab as such unless it is forced upon people. That it becomes an unsavory thing, a matter of detriment only insofar as it is actively imposed. You know, maybe a little bit like someone forcefeeding you good food–there is nothing traumatizing about eating good food, but when you’re forcefed against your will and choosing then it suddenly becomes detrimental. But this bypasses the possibility that there may be something toxic about the ideology of the hijab itself. To me, the list is a lot bigger and more complex–more like a web, of the possible detrimental influences the hijab can pose in various contexts. Disclaimer: I’m talking about one modesty doctrine in particular in this post. There are many forms of Muslim belief, practice, and interpretation, and not all women who wear the hijab subscribe to this ideology or have it imposed upon them. Some of them do it for non-modesty reasons entirely. 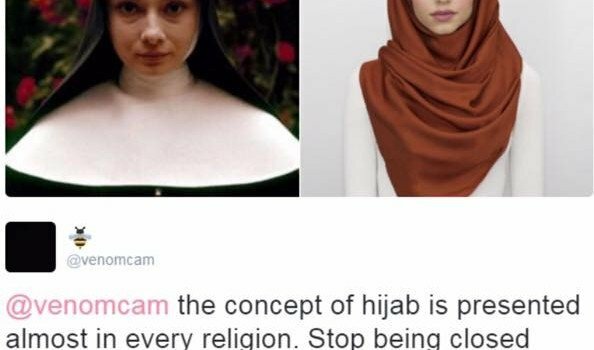 Thus this post is not about every possible form or motivation of the hijab. 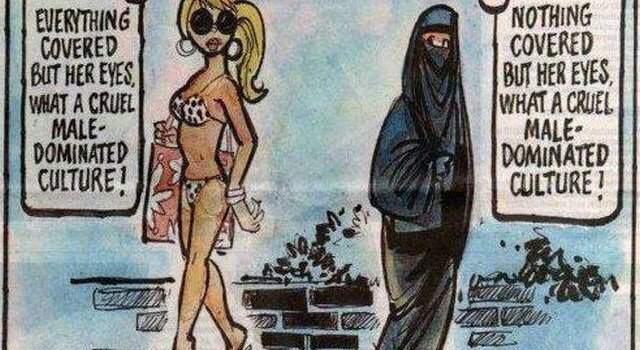 This post is about the reality of the mainstream, traditional modesty doctrines in large portions of the Muslim world. The problem is that for far too many people the hijab is not just a piece of cloth. It is a normative doctrine that claims moral rightness, that speaks to what bodies mean and how they should be viewed and treated and displayed. There are REASONS given for why women’s bodies need to be covered up, and most of these reasons boil down to viewing people’s bodies as objects of discord (fitnah) that are imperfect (awrah) and that are a temptation to others, whose visibility is a matter of honor and shame. Subscribing to an ideology that views your body as a shame and denigration in those ways can be incredibly psychologically damaging even without the coercion. It can also be ultimately objectifying, as I argue HERE. 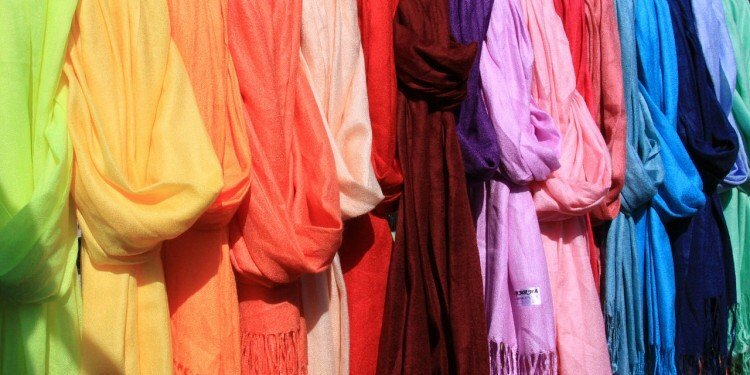 Critiquing the hijab does not boil down to objecting to women being coerced into it. It’s about the value system and what it stands for. And plenty of women who were never pressured into wearing their hijabs in any way end up taking issue with it for completely valid reasons that are other than being victimized by a tyrant father. Don’t silence their experiences by making the entire problem about choice or lack thereof. 1. Yes, coercion can and often does pose psychological detriment. Assuming coercion in the broad sense, to include shaming and pressuring as well as physical coercion. And no one is suggesting otherwise. That does NOT mean that it is the only possible thing that causes psychological detriment. I am saying that it is possible for a hijabi to NOT be coerced but to still suffer psychological detriment purely due to the demeaning nature of the modesty doctrine she chose to subscribe to. 2. Yes, the doctrine in question is incorrect, not least as demonstrated by sexual harassment rates in Muslim-majority countries and the prevalent existence of counterexamples where it is more than possible for women to walk around with bare skin without being irresistible temptations; ie, the modesty doctrines in question simply rest upon false grounds. But the fact that these reasons are false does not suddenly mean that they are not still actively used and taught as ideology, does NOT mean that the doctrines don’t exist, aren’t normative, and aren’t active motivators of people’s actions-whether you acknowledge that they are truly ‘Islamic’ or not. That is irrelevant. It doesn’t render them without damage. It doesn’t erase their detriment if you call them by another label. And YES, these are normative doctrines because they have moral content that other modes of dress do not. There is no doctrine or creed surrounding wearing jeans and a t-shirt that hashes them in terms of moral incumbency. This is why it’s relevant to many who have voluntarily chosen to subscribe to the ideology of the hijab. Yes, one can be shamed and pressured into bodily conduct harm by purely being coercive. And the thing that is being coerced does not itself necessarily have to be a matter of shame and self-worth. But it certainly can be. And the ideology behind the hijab as presented here *inherently entails* concepts of bodily shame and denigration by definition. That is to say, it is not only about conduct, about putting on or taking off pieces of clothing. It’s about putting on pieces of clothing in service of the goal of covering up one’s body, because it is the body that is the problem, and the clothing is there only as a means of hiding it. And when women’s bodies are viewed as problematic, that is where the oppression ensues. Structural oppression stems from dehumanizing ideology. It never exist in vacuum. And here I will get a little bit personal. I’ve been told that people ‘completely understand’ why I find it necessary to speak about the hijab so much, because I was coerced into it, of course! Of course!!! To them I say: I don’t know what you think you understand about me, but not even nearly half the damage for me has come from the fact that I was forced to dress in certain ways. Much of it came from the fact that the reasons for that coercion shamed my very existence and reduced me to a dehumanized object of discord. You do not get to deny basic human psychology that has proven conclusively that this sort of shaming that seeks to convince people that they are inferior can lead to psychological damage as severe as PTSD at times. If you insist that my damage came from only the coercion then you do NOT understand, will NOT respect what I say about an experience that I have had and that you have not and thus you canNOT effectively conceive of, and that you care more about abstract ideological defense than the actual reality of what it is for women. You are committing the ‘No True Muslim’ fallacy, along with the common generalization errors, the detriment of which I lay out HERE. And if you think you know because of who you know, I’ll remind you that what you see externally does not map onto internal lived experience. You can’t SEE everything. You clearly can’t see what this experience is like if you are denying half of it and contradicting the lived experiences of women, the testimonies they have about their bodies and lives. In line with that, I should stress that I am not at all suggesting that all women who wear the hijab, whether by conviction or coercion or a complex combination of the two, must necessarily or do suffer any sort of psychological damage whatsoever. Again, clearly not all women who wear the hijab wear it for the reasons stated, or subscribe to the ideology I’ve presented–there is significant variance. Plenty of women find it to be an emotionally fulfilling experience, and that is all well and good. But I’m not talking about those other more benign possibilities. I am rather suggesting that we take the damaging potential of the hijab as ideology seriously, and to listen to how it has actually affected people’s lives. I’ve known women who have had no choice regarding the hijab and have not viewed themselves to have been any the worse for it,and who am I to say any differently? On the other hand, I also know women who HAVE suffered detriment due to the ideology of the hijab and they are being silenced and that is oppressive. The point of this post is to oppose to the assumption there is nothing problematic in the doctrine itself, that it cannot at all pose psychological detriment to anybody by virtue of its ideological content. As for the “let’s just focus on the important thing: coercive actions” bit, I reject the idea, too, that a focus on actions presumes a lack of focus on the cultural ideology that motivates and inspires those actions. We focus on ideology precisely in service of affecting people’s actions, because actions are motivated by justification and ideology. I reject any presumption that certain modes of bodily conduct for women are ‘better’ than others. That is normative. Hell, that is the definition of normative, and by placing a matter of bodily autonomy into a category of moral superiority, you are pitting rights against perceived ‘duties’ and are treading unstable ground. To be perfectly clear: I AM rejecting the idea of chastity or modesty as an absolute moral good. I AM focusing on the hijab itself instead of the coercion, and I AM doing it deliberately instead of out of confused hurt resentment because someone made me wear the hijab therefore I must always irrationally hate it, oh noes. I’m not a confused, traumatized victim who has unjustified but understandable sentimetns, like someone who has an irrational phobia, or like I’m too stupid to differentiate between hating the attacker and hating the tool used. Seriously? No, I am objecting to the ideology behind the hijab because it offensive and demeaning to women AS SUCH. I am rejecting chastity and modesty as useful or correct norms. That is PRECISELY what I intend to be doing. I am not chaste and I do not want to be, and there is nothing wrong with that. 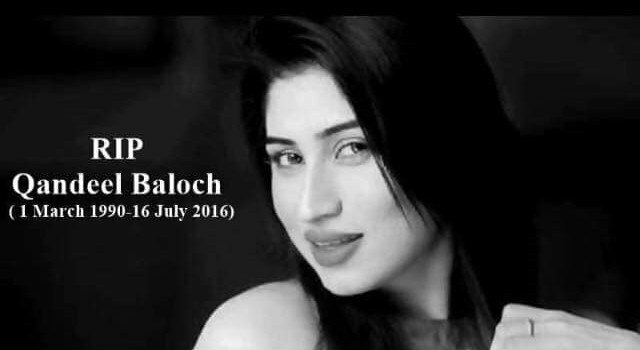 I am not ‘decent’ and I do not want to be, and there is nothing wrong with that. I’m not rejecting these attributes because modesty is forced upon women. I’m rejecting these attitudes out of ideological conviction, because they are nonsense, and gender theory acknowledges them to be so completely independently of any structural coercion. That being said, I oppose attacking and demeaning those who do wear hijab, even if I think the ideology behind the hijab is a toxic and detrimental thing. (See my essay ‘Don’t Judge a Woman by her Cover for more on why it’s never okay to judge an individual for their clothing choices). In short: my ideological opposition to the values of the hijab are precisely because clothing and baring of skin are morally neutral matters, and one’s self-worth or value or morality does not rest in them. That does not mean that I think that it is ‘better’ if people do not wear the hijab, that baring your head or skin is somehow morally superior in turn. It means that I think that clothing should not be a matter of ‘better’ or ‘worse’ to begin with, and that is where the problem lies. The objection is at the meta level: it’s not that it is morally wrong to wear or not wear certain things; it is morally wrong to place moral value and human worth in whether one wears or does not wear certain things. It is morally wrong to devalue human bodies as such unless one dresses in a certain way. Because it leads to coercion, mistreatment, and power inequalities, yes, but it also because it is a fundamentally flawed notion in itself. Upholding the values of bodily autonomy means rejecting particular personal modes of bodily conduct as normatively required, not as discrete personal choices. I hope I don’t need to spell out that this also means rejecting a normative claim that women ought not to wear the hijab or value modesty for themselves. Everyone has the perfect right to think what they will and do what they will about their own bodies. That being said, the presence of free choice, of bodily autonomy, does not render all ideologies of bodily conduct equal. Why I now have a ‘Donate’ button on my blog.